Living and doing business in the Internet Age has many benefits. However, we also live in a world where we are continuously under the potential threat of identity theft, having our websites and social media accounts hacked into and our business and personal data stolen, manipulated or erased. If you manage any web assets like a website for your organization, then you need to pay careful attention to digital security and the urgency of developing an digital business security plan. As well as creating an online security and website recovery plan for your business, you will also want to protect your files from accidents that can result in data loss and cause significant damage or disruption to your business. Having a way to fully restore your site, files or data in extreme situations is something that most people only appreciate after it’s too late. Then again, you may also want to save time. If your business involves setting up many websites or blogs, having a time-saving way to copy web site information from one website to another would be very convenient. As any experienced website owner knows, “it’s better to be safe than sorry.” Backing up your WordPress website, therefore, is something that everyone should do. The truth, however, is that left to their own devices, so few site owners do it, or don’t do it as often as it should be done. Let’s face it … getting your web site hacked, losing data, and doing things that permanently damage your site is all part of having a digital presence. If disaster ever strikes, then you will need a quick and easy way to restore old content, restore your site to an earlier version, or even complete reinstall your site and previous web content. 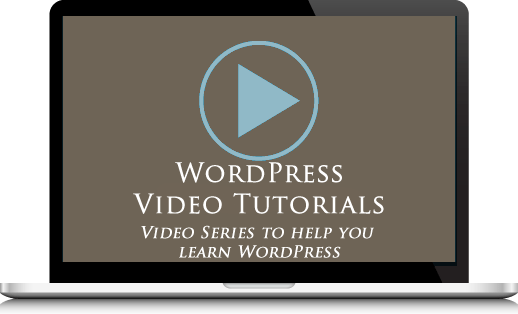 Fortunately, if you use WordPress, then there’s an easy solution that let’s you create backups of your WP database and website or blog files, copy your website to another location and restore your old site and content. 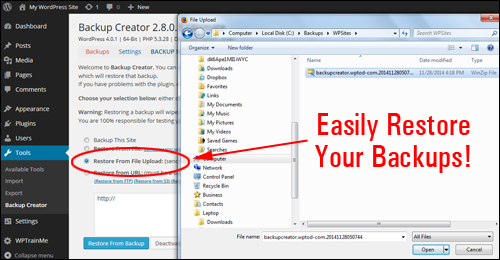 The Backup Creator WP plugin is a “one-click” solution for backing up your sites, cloning all of your websites and keeping your WP web sites protected. After the plugin has been installed on your WordPress site, your settings for the plugin can be quickly and easily configured. You can configure backups to run automatically, email backups, FTP backups, cloud backups, or store backups remotely using data storage tools like Amazon (S3) and Dropbox. Backup Creator is quite easy to install. Just upload a zip file that contains the plugin to your Plugin folder via your dashboard and activate. Enter the license code emailed to you with your purchase and the software will be ready to use. 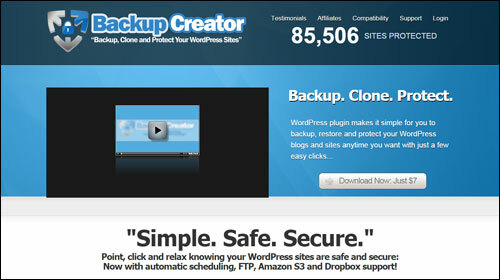 Backup Creator makes it very simple to back up, restore and protect your blogs and websites. It only takes a few mouse clicks. This makes Backup Creator an ideal backup tool for non-technical users. 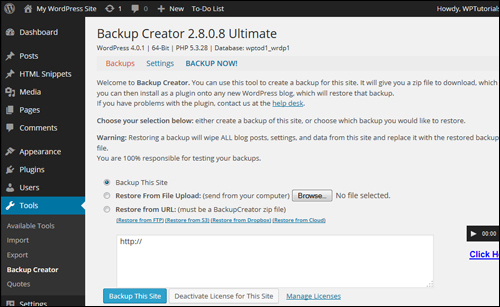 As well as saving time and benefiting from the peace of mind of knowing that your data can be recovered should something cause irreparable problems for your site, Backup Creator can be especially useful for anyone who needs to set up multiple WordPress sites with similar or identical settings. Once you’ve set up your master website, you can then clone as many duplicates as you want. That’s a lot of time saved setting up new sites. Backs Up Large Websites: Quite often, owners of very large websites can experience problems with backups. 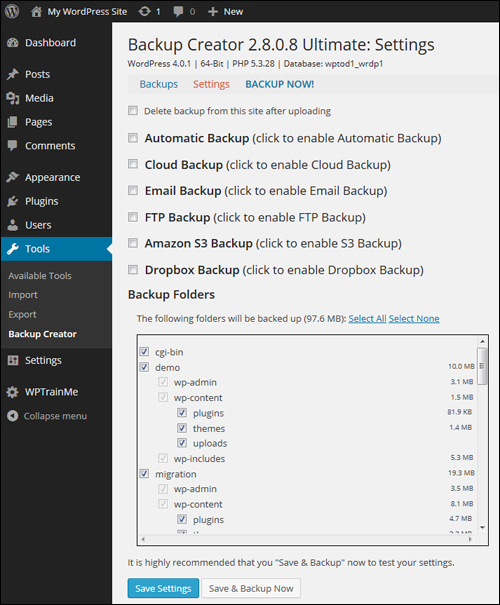 Many Backup Creator customers report being able to easily perform backups of large sites. Note: the plugin’s ability to back up sites containing large amounts of data depends on your webhosting service and your server settings. Peace Of Mind: We’ve mentioned this point already, but it’s worth repeating again. Knowing that your data and files can be recovered should any kind of problem affect your site is a priceless benefit, especially when things depend on your site being up and running. Instant Backup. One button is all you need to click to back up your site. Once your site is backed up, you can then send your backup files to the storage destination of your choice. Download the backup to your hard drive, email it to yourself, or even FTP the backup to an offsite location. Restore Anywhere. Instantly restore your WordPress website to any destination you like. You can copy files straight from another WordPress, upload via your browser or even transfer remotely via FTP, Amazon S3, or Dropbox. Proprietary Technology. 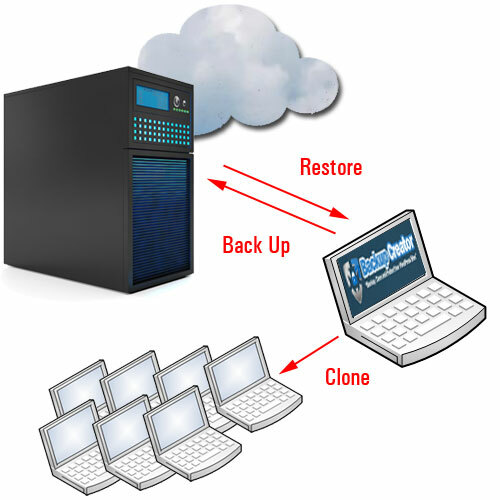 Backup Creator’s proprietary “Server-to-Server” technology ensures that you can quickly and easily deploy unlimited pre-configured client sites in a few seconds, without requiring FTP. Automatic Scheduling: Once you set up your backup schedule, the software takes over and does the rest automatically for you. There are no files to upload and no cron jobs or FTP is required. Simply select your schedule and you’re done. 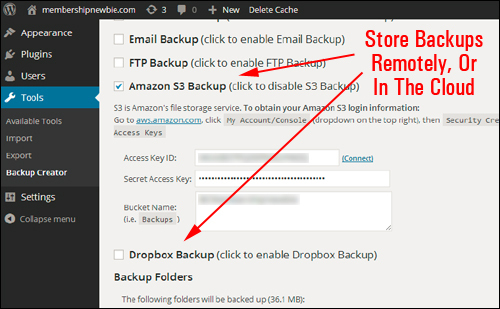 Backup With Dropbox, Amazon S3 r Remote FTP|Works With Remote FTP Or Cloud Storage Solutions. Restore, store and manage all of your site backups in a single offsite storage location and from anywhere in the world using remote FTP, Amazon S3, or Dropbox. Instant Documentation Of Site Processes. Instead of spending so much time documenting all of the processes needed to make a website or blog work “just right”, or writing out a blog setup manual, you can just set up your blog exactly the way you want it, make a backup copy|make an exact copy of site and then restore it on another location and now you’ve got an exact, “documented” copy of your blog setup. For example, let’s say that you want to set up several sites including identical plugins and settings in different niches. 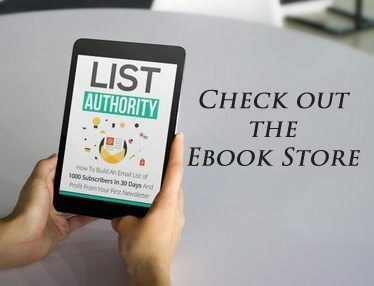 This could be for a franchise company, or a travel agency with branches in different locations, where each office will manage the content of their own separate blog. Think of all the time you’ve spent tweaking and finetuning your discussion settings, permalinks, configuring different plugins and navigation menus, creating site categories, customizing your theme, etc …. Now you can save loads of time and install a fully-functioning, perfectly configured site every single time with only a couple of mouse clicks. Clone A Site With Correct Internal Reference Links. 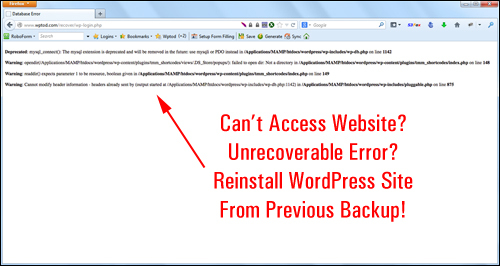 Simply backing up WP files and restoring WP files won’t duplicate your websites or blogs successfully. You also need to copy the WP database and ensure that your data references the new domain. Otherwise, your data will be restored to another location, but still be pointing back to the old location. That’s why it’s important to use a backup plugin that has been specifically developed for cloning. This allows you to back up site “A” in seconds and restore it to site “B” with all the theme customizations, plugins, settings and configurations included, and everything will be pointing to the new site (i.e. site “B”), instead of referencing the old one (site “A”). Don’t Fix Serious Problems … Restore! Here’s another great time-saving tip: if your blog ever gets hacked, or an unauthorized user somehow gets in and causes some kind of damage to your site, don’t spend days or weeks trying to repair or figure out the problem, just make a backup of your site, delete everything, then restore a previous working version. 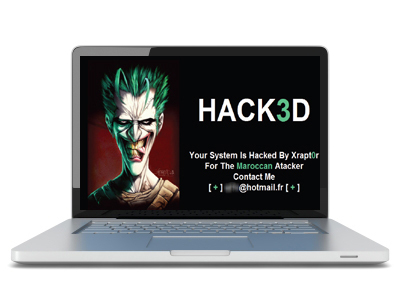 Your site will be instantly returned to normal and you can send the damaged files to a WordPress support expert who can then try to understand how your site got broken into and how to repair or identify any vulnerabilities. Keep A Historical Record Of Your Web Site’s Changes. 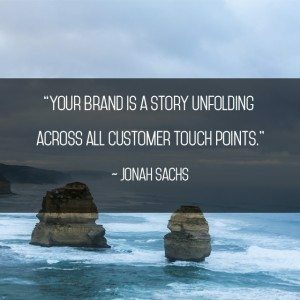 Imagine that a few years from now your business has grown and transformed into an online success. Wouldn’t it be great to show people how everything got started? Or maybe you’ve made things so complex and would like to restore things to a place of simplicity. Perhaps you’ve accidentally deleted a bunch of articles or videos and want to get those back. If you keep a weekly backup of your site, the chances of losing important files are very low because you no longer need to be concerned about where you have stored or organized everything. Just recall when you remember you had that content, restore the backup (note: the backup can be located anywhere, even on a test site) and grab the file you need. 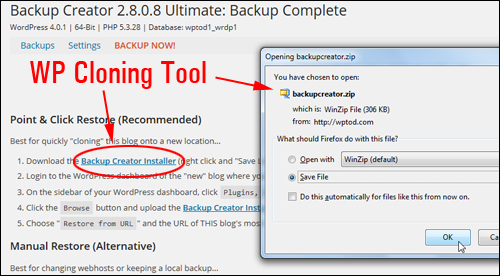 Backup Creator is a robust and well-supported plugin. 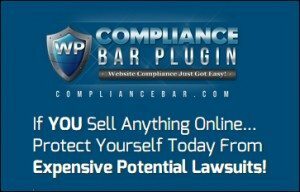 It was authored by Robert Plank, lead WordPress plugin developer for Double Agent Marketing LLC. 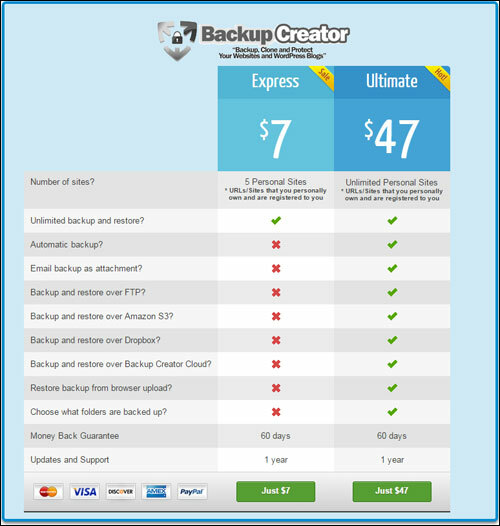 Backup Creator support includes a detailed step-by-step online user guide, video tutorials, support helpdesk and 1 year of free software upgrades and new releases with their purchase, backed by a risk-free, 60 day, complete refund guarantee. Note: Check the plugin website for a list of web hosts that support the plugin and any known issues with these. Express Edition – Backup Creator Express edition lets you install the plugin on up to 5 personal URLs that you own. You can perform unlimited backups and restores only. Cost = $7.00. Ultimate – Backup Creator Ultimate lets you install the plugin on unlimited personal domains, as well as schedule automatic backups, send email backups as an attachment, back up and restore over FTP, Amazon S3, Dropbox plus Backup Creator Cloud, restore backups from browser uploads and choose which folders get backed up. Cost = $47.00. 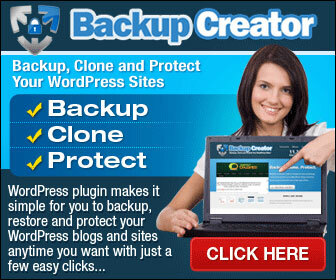 Developer – Backup Creator Developer lets you install the plugin on unlimited personal and client sites. You can also flip websites with the plugin installed. Note: Developer license is only available as an upgrade inside your product download area. Cost = $100.00 ( the cost of purchasing either the Express or Ultimate plugin editions). Note: The cost of purchasing the product can vary, depending on whether there are any promotions or limited-time specials being offered. Presently, the software sells for the amounts shown above. This may not be the actual price set by the plugin seller when you visit the plugin site and there may be additional upsells or one-time offers after you’ve purchased. For a demo video showing how the plugin works, including help documentation and tutorials, FAQs, customer help desk, testimonials, contact details and more, visit the Backup Creator website. Performing regular backups of your site’s files and database is an essential aspect of doing business online and ensuring that your site remains protected from disaster. 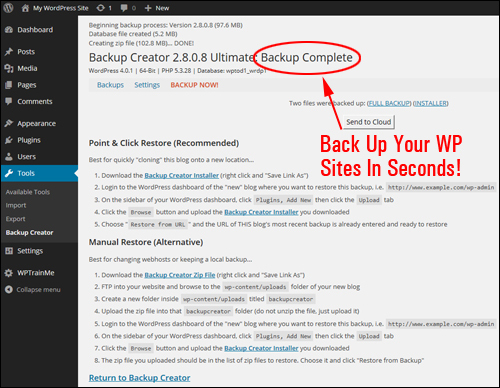 There are many great WP backup plugins available, but BackUp Creator doesn’t just perform backups, it also allows you to completely duplicate your sites. 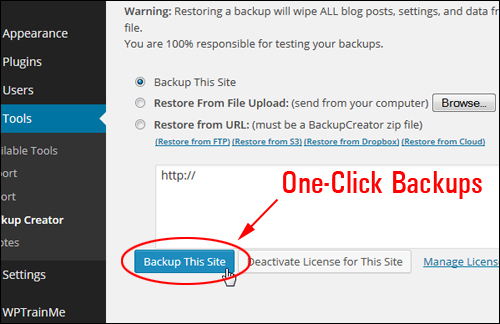 For this reason, we strongly recommend using Backup Creator to backup, clone and protect your WordPress websites and blogs.